Four years ago, I decided to shift my research focus from social marketing and consumer psychology to health psychology and patient-physician decision making. I felt that my past research experience involving cultural influences on consumer decision making might be of assistance to and benefit from cross-disciplinary collaboration with experts in the health field. However, I was uncertain about ways to make connections and learn about major issues of interest in the area of patient-physician decision making. 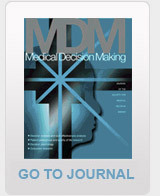 Fortunately, I found the Society for Medical Decision Making and attended my first meeting in Toronto in 2010. I was amazed at how easy it was to talk to leaders in the field whether during the interesting oral and poster sessions, through the Dinner with Experts Program or simply having coffee during a break. I never felt that I was a newcomer even though I was. SMDM members welcomed me and engaged in conversation with me about topics of mutual interest right from the start. This same spirit of engagement and respect continues today and has enabled me to form multiple collaborations with leading researchers in both the West and in Asia. As a result, I have had the opportunity to learn from the best minds in the field and to develop a research program in this new area much faster than would have been possible alone. As we say in Hawaii, I have a "much Aloha" for SMDM and its amazing members and staff. I look forward to my future involvement with the Society and I'm happy to assist anyone else who wishes to learn more about our field and our organization.